Near Field Communication (NFC) is steadily gaining popularity, but not fast enough for some people. 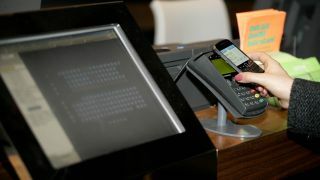 In fact, Visa and Samsung announced today a global alliance to accelerate the spread of NFC technology on mobile devices. With the agreement, Samsung will start preloading Visa's contactless payment applet, payWave, onto "selected next-generation" NFC devices. Maybe we'll even see payWave on the soon to be announced Galaxy S4. "The partnership with Visa represents a step towards a global mobile payment platform," Won-Pyo Hong, president of Samsung's Media Solution Center, said in a press release. "We believe that we have a strong value proposition for financial institutions that will ultimately allow consumer choice in NFC payments." The deal also greases the way for financial institutions to use Visa's Mobile Provisioning Service on Samsung's smartphones. The system lets banks more easily and securely link Visa payment accounts to consumers' devices. It gives mobile phone users and services access to a secure mobile payment infrastructure without having to create their own payment apps or channels to exchange money. If Visa's Mobile Provisioning Service gains enough traction it could provide the launchpad for the NFC revolution, though the service debuted a year ago at MWC 2012 without much fanfare. NFC is nothing new, but it's a technology that has struggled to gain traction. Many companies have been interested in developing NFC as a commerce tool, and as an alternative to credit cards. Companies such as AT&T, Google and PayPal have been trying to grow a mobile payment NFC infrastructure by offering digital wallet apps and encouraging businesses to invest in NFC payment stations. However, it's been slow going. Though the deployment of NFC is slowly gaining ground, Visa is betting it will eventually be embraced by the public at large. In the press release, the card company sited an ABI Research forecast that predicts around 1.95 billion NFC-enable devices will ship in 2017. With partnerships between Visa and Samsung and payment apps like Isis popping up, we may just get past the NFC tipping point. The Galaxy S4, set to debut during a NYC event March 14, could provide the mobile commerce industry a much needed boost.